The very first time I posted a Laxmikant Pyarelal soundtrack, I described the duo as "makers of many a fine score... and an equal number of not so fine". I reckon I've done pretty OK in locating and posting soundtracks belonging to the former category, and I hope a lot of you will find that 'Aas Paas' is one of them. For to be honest, most of it isn't for me. Most of it. Songs seem to meander pleasantly along, without there being anything to really grab hold of. Even cabaret number 'Main Phool Bechti Hoon' sounds unassuming. 'Too Kahin Aas Paas Hai Dost' was apparently the last thing Mohd. Rafi did; his voice is as lovely as ever but it's hardly his most memorable moment. What is memorable though is 'Ham Ko Bhi Ghamne Mara', a complexly and exquisitely arranged psych-tinged Lata Mangeshkar ballad; conjuring up images of Spanish cantinas or Middle-Eastern bazaars, or both. It's quite hypnotic, and the album's undisputed highlight. Last recorded song of Mohd. 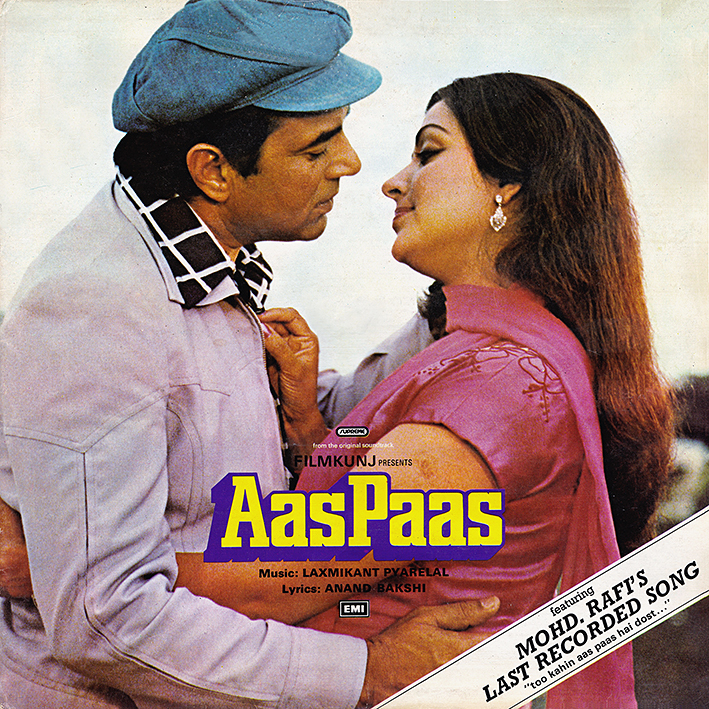 Rafi is from Aas Paas. But the last released song of Mohd. Rafi was in Farz Ki Jung (1989)... Aap Ka Jawaab Kya composed by Bappi Lahiri. thank you so much. have been listening to tum jo chale gaye to in particular because of the voice of kishore and secondly lyrics are good too. can anyone please send the zip file to rajhp2001@yahoo.com as all download links are not working.